Secondary Inscription: Inscribed upper pastedown, in blue ink, "At Sion College, London, there is a copy of these works dated 1277 [i.e., Ms. Ludwig XV 4] . . . The pictures in the Sion College Ms are identical with those in this Ms as regards position and subject, but are of coarser execution. The name Physiologus is not mis-written Phylosophus as in this Ms." (Sydney Cockerell's notes). Inscribed lower pastedowm, in pencil, "i-x 8, xi 1,3-6,8, xii-xiii 8=102 leaves. / HPK per JSK I/70" (collation by John S. Kebabian for H.P. Kraus). Bestiaries, collections of moralizing descriptions of animals both real and legendary, were among the most popular books of the 1100s and 1200s. A pseudo-scientific catalogue, bestiary texts were drawn from the Greek Physiologus. Originally composed in the first centuries of the Christian era, translated into Latin in the 300s, and augmented throughout the Middle Ages, a bestiary explained the natural world in terms of Christian symbolism and precepts. The Getty Museum's manuscript is a compilation that includes two rare treatises by Hugo de Fouilloy in addition to the Bestiary. The first text is the Aviary, which uses the characteristics of different types of birds to make moral points. 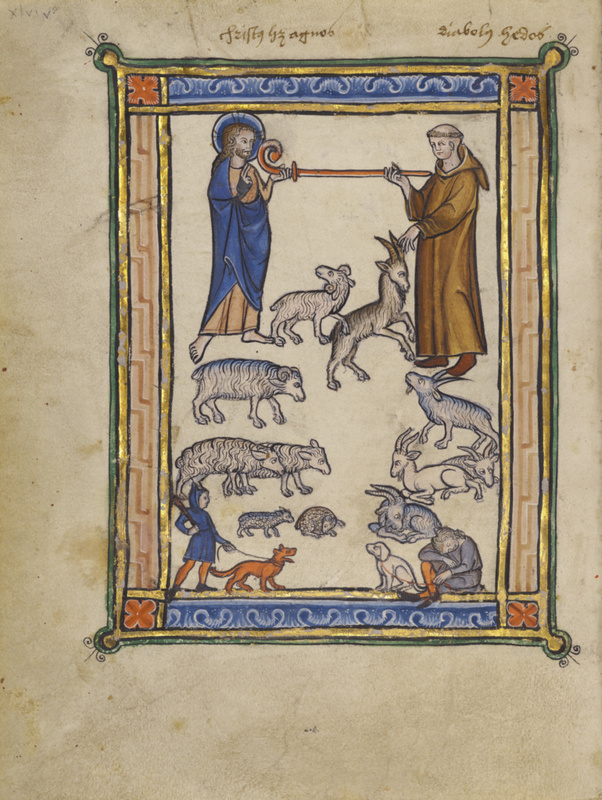 The second, Treatise on Flocks and Shepherds, constructs a metaphorical discussion of Christ as an abbot, taking care of his flock, and the abbot and monks in a monastery caring for their charges. Both of Hugo's Latin texts were intended for teaching lay brothers, those who performed manual work in a monastery. This manuscript, though made around 1270 in Flanders, is stylistically close to contemporary elegant Parisian illuminations produced at the court of King Louis IX, which are characterized by gracefully gesturing figures, vigorous outlines, and gold-patterned backgrounds. Sotheby's, London. Collection of Manuscripts [...] of the Rt. Hon. The Earl of Ashburnham known as The Barrois Collection. June 10, 1901, lot 288, unpaginated. Cockerell, Sydney Carlyle. Exhibition of Illuminated Manuscripts, exh. cat. (London: Burlington Fine Arts Club, 1908), p. 40, no. 82, fig. 81. Warner, George. Descriptive Catalogue of Illuminated Manuscripts in the Library of C. W. Dyson Perrins. 2 vols. (Oxford: Oxford University Press, 1920), pp. 77-83, no. 26, entry by Sydney Carlyle Cockerell. James, Montague Rhodes. The Bestiary, being a reproduction in full of the manuscript Ii. 4. 26 in the University Library, Cambridge, with supplementary plates from other manuscripts of English origin, and a preliminary study of the Latin bestiary as current in England (Oxford: Oxford University Press, 1928), pp. 9-11, 25. Sotheby's, London. The Dyson Perrins Collection: Part I. December 9, 1958, pp. 21-23, lot 7, pls. 7-9. McCulloch, Florence. Mediaeval Latin and French Bestiaries (Chapel Hill: The University of North Carolina Press, 1960), p. 41. Beer, Ellen J. "Zum Problem der 'Biblia Porta.'" In Festschrift Hans R. Hahnloser (Basel and Stuttgart: Birkhäuser Verlag, 1961), pp. 286, 288, fig. 15. May, Helmut, ed. Weltkunst aus Privatbesitz, exh. cat. (Cologne: Druckerei J. P. Bachem, 1968), no. D 60, fig. 35. Ohly, Friedrich. "Probleme der mittelalterlichen Bedeutungsforschung und das Taubenbild des Hugo de Folieto." Frühmittelalterliche Studien 2 (1968), pp. 162-200n16, 201. Ker, Neil Ripley. Medieval Manuscripts in British Libraries. 5 vols. (Oxford: Clarendon Press, 1969-2002), vol. 1 (1969), p. 283. Stahl, Harvey. "Le Bestiaire de Douai." Revue de l'Art 8 (1970), pp. 7n5, 8n10. Stones, Alison "The Illustration of the French Prose Lancelot in Belgium, Flanders and Paris, 1250-1340." Ph. D. diss. (University of London, 1970). de la Mare, Albinia. Catalogue of the Collection of Medieval Manuscripts Bequeathed to the Bodleian Library Oxford by James P. R. Lyell (Oxford: Clarendon Press, 1971), pp. 212-13. Kraus, Hans P., ed. Monumenta Codicum Manu Scriptorum, exh. cat. (New York: H.P. Kraus, 1974), p. 52, no. 21, ill.
Sotheby's, London. Catalogue of Important and Valuable Printed Books and Manuscripts the Property of Sion College. June 13, 1977, p. 73-77, lot 72, ill.
Kraus, Hans P. A Rare Book Saga: The Autobiography of H.P. Kraus (New York: G.P. Putnam's Sons, 1978), pp. 332-33. Kraus, Hans P. In Retrospect: A Catalogue of 100 Outstanding Manuscripts sold in the last four decades by H. P Kraus (New York: H. P. Kraus, 1978), pp. 40-41, no. 14. Mazal, Otto. Buchkunst der Romanik (Graz: Akademische Druck- und Verlagsanstalt, 1978), p. 92. Carlvant, Kerstin Birgitta Elisabet. "Thirteenth-Century Illumination in Bruges and Ghent.” Ph.D. diss. (New York, Columbia University, 1978), pp. 74, 76, 77. Häring, Nicholas Martin. "Notes on the 'Liber Avium' of Hugues de Fouilloy." Recherches de théologie ancienne et médiévale 46 (1979), p. 80, no. 53. Clark, Willene B. "The Illustrated Medieval Aviary and the Lay-Brotherhood." Gesta 21, no. 1 (1982), pp. 63-73n22, 74. "Manuscript Acquisitions: The Ludwig Collection." The J. Paul Getty Museum Journal 12, 1984, p. 304.
von Euw, Anton, and Joachim M. Plotzek. Die Handschriften der Sammlung Ludwig. 4 vols. (Cologne: Schnütgen-Museum, 1979-1985), vol. 4 (1985), pp. 172-87. Camille, Michael. "Seeing and Reading: Some Visual Implications of Medieval Literacy and Illiteracy." Art History 8, no. 1 (March 1985), pp. 26-49, fig. 5. The J. Paul Getty Museum Handbook of the Collections. 1st ed. (Malibu: J. Paul Getty Museum, 1986), p. 72, ill. The J. Paul Getty Museum Handbook of the Collections. 2nd ed. (Malibu: J. Paul Getty Museum, 1988), p. 72, ill.
Oliver, Judith. Gothic Manuscript Illumination in the Diocese of Liege (c. 1250-c. 1330). 2 vols. (Leuven: Uitgeverij Peeters, 1988), I, 160, 163 n. 70. Clark, Willene B., and Meradith T. McMunn, eds. Beasts and Birds of the Middle Ages: The Bestiary and Its Legacy. (Philadelphia: University of Pennsylvania Press, 1989), p. 197. Mermier, Guy R. "The Phoenix: Its Nature and Its Place in the Tradition of the Physiologus." In Beasts and Birds of the Middle Ages: The Bestiary and Its Legacy. Willene B. Clark and Meradith T. McMunn, eds. (Philadelphia: University of Pennsylvania Press, 1989), pp. 69-85, fig. 4.1. Hamburger, Jeffrey F. The Rothschild Canticles: Art and Mysticism in Flanders and the Rhineland circa 1300 (New Haven and London, 1990), pp. 48, 298n44. Gousset, Marie-Thérèse, and Patricia Stirnemann. "Indications de couleur dans les manuscrits médiévaux." In Pigments et colorants de l'antiquité et du moyen âge (Paris: Éditions du CNRS, 1990), p. 191. Stones, Alison. "Indications écrites et modèles picturaux, guides aux peintres de manuscrits enluminés aux environs de 1300." In Artistes, artisans et production artistique au moyen âge (Paris: Picard, 1990), pp. 329-30, fig. 15. Alexander, Jonathan J. G. Medieval Illuminators and Their Methods of Work (New Haven: Yale University Press, 1992), p. 171n24. Clark, Willene B. The Medieval Book of Birds: Hugh of Fouilloy's Aviarium (Binghamton: University of New York at Binghamton, 1992), p. 62, no. 28, figs. 57a-c.
Eissenhauer, Michael, ed. Ludwigs Lust: Die Sammlung Irene und Peter Ludwig, exh. cat. (Nuremberg: Germanisches Nationalmuseum, 1993), cat. no. 98, pp. 130, 477, ills. (fol. 46v), entry by Regina Marth. Busby, Keith. "Index of Former Owners." In Les Manuscrits des Chrétien de Troyes. Keith Busby, ed. 2 vols. (Amsterdam: Rodopi, 1993), vol. 2 (1993), pp. 96-97. Belle, Ronald van. "Enhele grafplaatfragmenten uit de Onze-Lieve-Vrouwekerk te Brugge en hun inspiratiebron." Het Brugs Ommeland 1 (1995), p. 44, fig. 4.
von Euw, Anton. "L'enluminure. "In Un trésor gothique: La châsse de Nivelles, exh. cat. (Cologne: Schnütgen-Museum; Paris: Éditions de la Réunion des Musées Nationaux, 1996), pp. 262-63, fig. 1. Fredericksen, Burton B., et al. Masterpieces of the J. Paul Getty Museum: Paintings (Los Angeles: J. Paul Getty Museum, 1997), p. 49, no. 18, ill., entry by Adam S. Cohen. Hassig, Debra. "Marginal Bestiaries." In Animals and the Symbolic in Mediaeval Art and Literature. L.A.J.R. Houwen (Groningen: Egbert Forsten, 1997), p. 173, pl. 9. Smeyers, Maurits. Flemish Miniatures from the 8th to the mid-16th Century: The Medieval World on Parchment (Turnhout: Brepols, 1999), pp. 128-29, 172, no. 36. Meuwese, Martine. "Die Illumination der Detmolder Der Naturen Bloeme-Handschrift." In Jacob van Maerlants "Der naturen bloeme" und das Umfeld: Verläufer - Redaktionen - Rezeption. Berteloot, Amand and Detlev Hellfaier, eds. (Munich: Waxmann Münster, 2001), p. 146, fig. 23. Strickland, Debra Higgs. Saracens, Demons, and Jews: Making Monsters in Medieval Art (Princeton and Oxford: Princeton University Press, 2003), 265. Noel, William, and Daniel Weiss, eds. The Book of Kings: Art, War, and the Morgan Library's Medieval Picture Bible (Baltimore: Walters Art Museum, 2002), p. 162, no. 10, ill.
Hansell, Jean. Images of the Dove (Bath: Millstream Books, 2003), p. 93, ill.
Morrison, Elizabeth. Beasts: Factual & Fantastic (Los Angeles: J. Paul Getty Museum; London: The British Library, 2007), pp. 28-29, 57, 62-67, 78, 82, 90-91, figs. 19, 50-56, 66, 72, ill.
Grosse Bibliotheken der Welt: Schätze des J. Paul Getty Museums, Los Angeles (Gütersloh and Munich: Faksimile Verlag, 2009), p. 16. Morrison, Elizabeth, and Anne D. Hedeman, eds. Imagining the Past in France: History in Manuscript Painting, 1250-1500 (Los Angeles: J. Paul Getty Museum, 2010), p. 117n10, under no. 8, entry by Anne D. Hedeman; p. 120n14, under no. 9, entry by Elizabeth Morrison. Kren, Thomas. Illuminated Manuscripts from Belgium and the Netherlands in the J. Paul Getty Museum (Los Angeles: J. Paul Getty Museum, 2010), pp. 11, 34, 43-47, ill.
Waldmann, Klaus. "Come in un film: Vedere la Storia al Getty Museum." Alumina Pagine Miniate 9, no. 33 (April-June 2011), pp. 58-59, ill.
Heck, Christian, and Rémy Cordonnier. Le bestiaire médiéval: L'animal dans les manuscrits enluminés (Paris: Éditions Citadelles & Mazenod, 2011), pp. 184, 249, ill.
Toussaint, Jacques. "La Baleine: Un 'Grand Poisson' Généralement Très Redoutable." In Fabuleuses Histoires des Bêtes et des Hommes, exh. cat. (Namur: Société archéologique de Namur, 2013), pp. 57, 58, ill., 59. Stones, Alison. Gothic Manuscripts 1260-1320. 2 vols. (London: Harvey Miller, 2013), part 1 (2013), vol. 1, pp. 22, 39, 69, 100, fig. 768; vol. 2, pp. 195, 257, 301, 545, 548; part 2 (2014), vol. 2, p. 234n55. Russo, Alessandra, Gerhard Wolf, and Diana Fane. 2015. Images take flight: feather art in Mexico and Europe (1400-1700) (Munich: Hirmer, 2015), pp. 66-67, fig. 49. Kempf, Damien, and Maria L. Gilbert. Medieval Monsters (London: British Library, 2015), p. 24, ill.
Ogden, Jack. Diamonds: An Early History of the King of Gems (New Haven: Yale University Press, 2018), p. 3, fig. 1.3.